Under the leadership on the Philippine Department of Energy (PDOE) and the U.S. Agency for International Development (USAID), a modeling team consisting of representatives from NREL, PDOE, the Grid Management Committee, the National Grid Corporation of the Philippines (NGCP), and the Philippine Electricity Market Association produced the study Greening the Grid: Solar and Wind Integration Study for the Luzon-Visayas System of the Philippines. The team used advanced weather and power system modeling to explore a variety of questions about the operational impacts of reaching high levels of solar and wind energy on the Luzon-Visayas power system, which comprises the largest integrated grid in the Philippines. The study examines the implications of achieving 30% and 50% renewable energy targets in the system planned for 2030. Variable solar and wind energy meets up to 37% of annual electricity demand in the 50% renewable energy scenarios, up from approximately 2.5% in 2016. The study did not find a technical limit to RE penetration: the modeled 2030 Luzon-Visayas system can balance all high RE scenarios on an hourly basis. This finding indicates that the planned 2030 system has the technical capability to reach a 50% RE target, even when the majority of this RE comes from variable solar and wind. The study assumed the addition of generation and transmission capacity based on existing power sector development plans outlined by PDOE and NGCP. These additions represent significant expansion beyond the power system infrastructure that exists today and will aid the integration of variable RE, likely resolving some of the integration-related issues, such as solar and wind energy curtailment, that have occurred in the Philippines since 2014. Curtailment refers to the amount of renewable energy generated that cannot be used due to grid limitations. With these infrastructure enhancements, the Luzon-Visayas power system has the flexibility to accommodate the variability associated with solar and wind energy, with relatively little curtailment. Accessing this flexibility to achieve cost-effective renewable energy integration will involve changes to how the power system is operated. For example, conventional generators (especially coal and natural gas) may need to start and stop more frequently, spend more time at their minimum stable outputs, and increase and decrease their output more rapidly in systems to achieve high levels of solar and wind energy on the grid. Achieving high levels of solar and wind integration will require coordinated planning of generation and transmission to facilitate the development of Luzon and Visayas’ highest-quality solar and wind resources. Strategic, economic curtailments of solar and wind energy can enhance system flexibility (combined solar and wind curtailment does not exceed 7.6% in any scenario). Reserve shortage may become an issue in the 2030 system regardless of renewable energy penetration. Solar and wind generators can provide some types of reserves to the power system if they are allowed to qualify as reserve providers. Additional reserves from conventional generators and/or enhanced reserve sharing between the Luzon and Visayas grids can also help to alleviate potential shortages. This study complements other power system planning analyses, such as capacity expansion and load flow modeling, that Philippine power system planners routinely undertake. Taken together, these studies can inform that evolution and contribute to the analytical basis for addressing the technical barriers to achieving a low-cost, clean, reliable, and flexible Philippine power system. Scenario design, input data, assumptions, and study results were validated extensively by experts from across the Philippine power sector -- through both the interagency modeling team and a broad Technical Advisory Committee. Stakeholder review and guidance were provided by experts from more than 20 institutions, including government agencies, electricity grid and market operators, regulators, transmission and distribution companies, renewable energy developers, independent power producers, utilities, research institutions, and other international experts. The study’s implementation was made possible with significant support from the USAID Building Low Emission Alternatives to Develop Economic Resilience and Sustainability (B-LEADERS) Project. For additional details, download the full study. In 2014, under the Enhancing Capacity for Low Emission Development Strategies (EC-LEDS) program with U.S. Agency for International Development (USAID), NREL's National Wind Technology Center and Geospatial Data Science Team applied modern approaches to update previous estimates to support the development of wind energy potential in the Philippines. The new assessment includes more economically viable wind potential closer to loads and infrastructure to promote wind development in the region by providing wind resource information that informs and attracts renewable investors and developers to the region. This assessment also expands the current data set from 30-meter (m) to 30m, 50m, 80m, 100m, 140m, and 200m, and offers the latest generation technology for a physically-based model, numerical weather prediction, long-term representative with detailed information about frequency distribution, shear/wind direction, temperature, air density and temporal information. The resource assessment will be ongoing and the products developed will include national and regional resource potential maps, siting studies, and access to the measurement data. The 1-kilometer wind resource assessment grid was based on surface wind data, coastal marine area data, and upper-air data, where applicable. The modeling assumptions had a scope of one Typical Meteorological Year (TMY) with forced sampling from a 15-year period using Day 1 TMY from Year 1 and Day 2 TMY from Year 2 and so on. In data-sparse areas, three qualitative indicators of wind speed or power were used when applicable: topographic/meteorological indicators (e.g. gorges, mountain summits, sheltered valleys); wind deformed vegetation; and eolian landforms (e.g. playas, sand dunes). The data was evaluated at a regional level to produce 12 regional wind resource assessments; the regional assessments were then incorporated into the national wind resource assessment. The modeling specifications, included using the Weather Research and Forecasting model (WRF 3.5) with inputs from the European Centre for Medium-Range Weather Forecasts (ERA-Interim Reanalysis) for boundary conditions and U.S. Geological Survey for terrain data. To view and download wind data for the Philippines, please visit the Renewable Energy Explorer and launch the Association of Southeast Asian Nation (ASEAN) Renewable Energy Data Explorer. In September 2018, the Philippines Department of Energy (PDOE) issued a Department Circular on the "Establishment and Development of Competitive Renewable Energy Zones in the Country," which formalizes the process of identifying renewable energy zones (REZs) that connect the country's power transmission development to areas with excellent renewable energy resources. The figure below shows a map of available resources which will be used to help select suitable REZs. NREL's Renewable Energy Zone (REZ) Transmission Planning Process served as a valuable guide for the planned approach to integrate transmission expansion and renewable energy generation planning. This guide was developed as part of the U.S. Agency for International Development (USAID)-NREL Partnership, which helps countries with policy, planning, and deployment support for advanced energy technologies. The USAID-NREL Partnership helped the PDOE reach this point through a multi-year collaboration, which recently produced a solar and wind integration study, demonstrating that renewable energy targets of up to 50% are achievable in the 2030 planned power system in the Philippines. 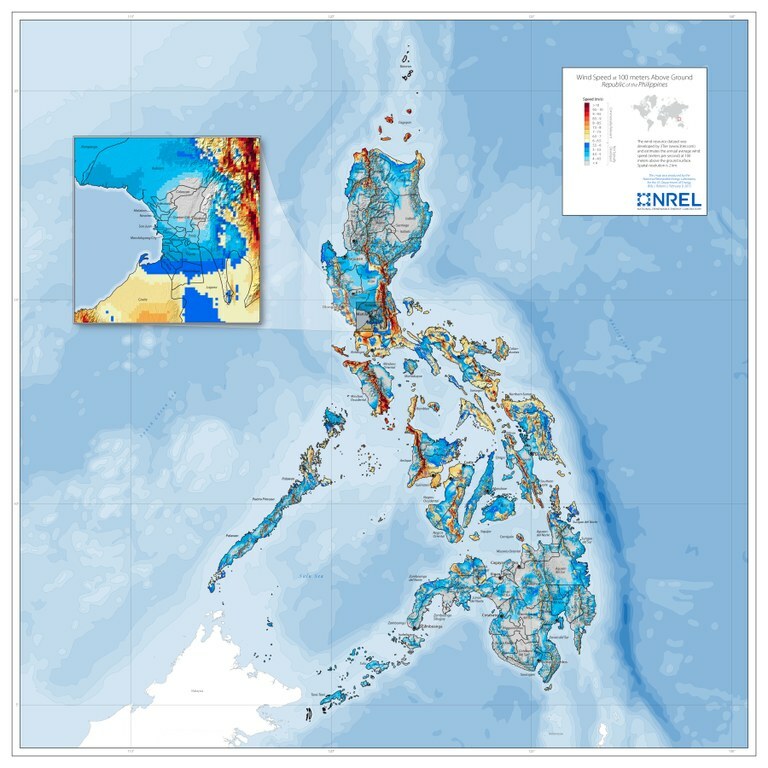 This multi-year collaboration also produced an updated Philippines Wind Atlas and an RE Data Explorer geospatial tool that supports renewable energy exploration in the Philippines. The government now aims to implement cost-effective power sector enhancements throughout the entire country. The image below is from the meeting of the Technical Advisory Committee for the Philippines CREZ process which convened in October 2018. The Department of Energy of the Philippines (DOE), USAID Clean Power Asia, Chulalongkorn University, the National Renewable Energy Laboratory, and Lawrence Berkeley National Laboratory are partnering to evaluate the economic and technical implications of distributed PV (DPV) deployment in the Philippines. The analysis will focus on the impacts of the existing net metering arrangement, help inform the revision of the net metering rules and evaluate alternatives to net metering. This analysis will consist of qualitatively reviewing the rules of the current net metering scheme and quantitatively simulating and comparing the impacts of alternative compensation mechanisms for different customer groups. The process of developing customer profiles and quantitatively assessing the economic value of the DPV system to the customers under various compensation mechanisms is detailed in the figure below. The results of this analysis will include: 1) detailed recommendations for DPV compensation mechanism design, including appropriate compensation levels; and additional recommendations for policy and regulatory revisions to incentivize greater DPV adoption while achieving other policy objectives. This analysis will consist of qualitatively reviewing the current regulatory framework for integrating DPV into the rate-making process and presenting how DPV influences avoided costs and revenue losses for utilities as well as rates for customers. The analysis will also quantitatively analyze the impact of DPV deployment and various compensation mechanisms on utility revenues and retail rates in the short- to medium term. This would include a holistic assessment of the costs (e.g., foregone sales revenue) and the benefits (e.g., avoided generation costs, line loss reductions) of DPV deployment. The figure below highlights the process of assessing the impacts of DPV market conditions and operations on utility revenue and rates. The results of this analysis will inform DPV compensation mechanism design and retail rate re-design for DPV customers. This analysis will review current grid codes and simulate various DPV deployment levels to assess the technical impacts on the distribution grid in terms of voltage, line losses and line capacity utilization. DPV integration can result in voltage rises, particularly close to the installation which can affect distribution operations and equipment. High levels of DPV penetration can also cause reverse power flow, leading to increases in line losses, which translates to reduced utility revenue. Finally, DPV can result in changes to the utilization of distribution equipment, either deferring or accelerating system investments depending on the system specifics. Changes in utility planning and operation practices to accommodate greater DPV penetrations while minimizing costs to the utilities. 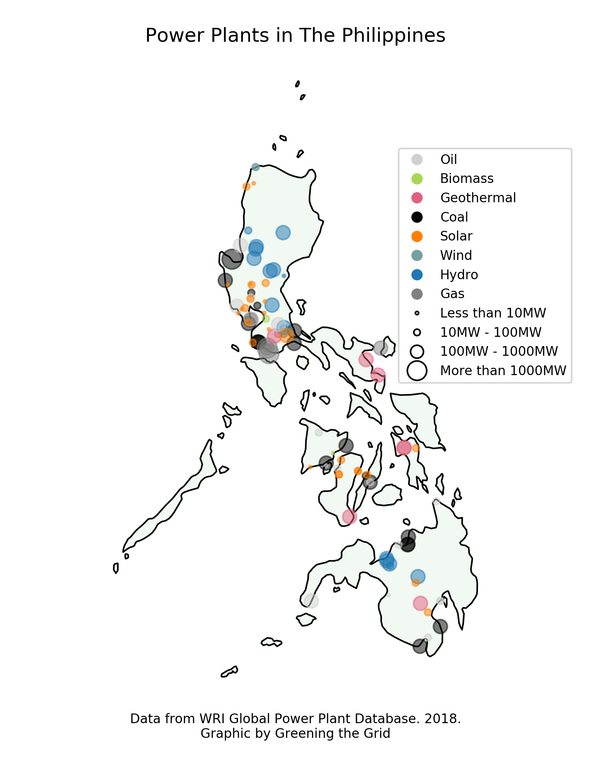 The map below shows the location, type and size of power plants operating in the Philippines.